The most detailed portrait ever of the Earth's land surface is being created with ESA's Envisat environmental satellite. The GLOBCOVER project aims at producing a global land cover map to a resolution three times sharper than any previous satellite map. 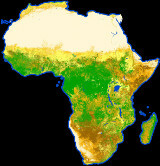 It will be a unique depiction of the face of our planet in 2005, broken down into more than 20 separate land cover classes. The completed GLOBCOVER map will have numerous uses, including plotting worldwide land use trends, studying natural and managed ecosystems and modelling climate change extent and impacts. 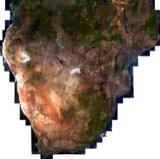 Envisat's Medium Resolution Imaging Spectrometer (MERIS) instrument is being systematically used in Full Resolution Mode for the project, acquiring images with a spatial resolution of 300 metres, with an average 150 minutes of acquisitions occurring daily. The estimate is that up to 20 terabytes of imagery will be needed to mosaic together the final worldwide GLOBCOVER map â€“ an amount of data equivalent to the contents of 20 million books. The image acquisition strategy is based around regional climate patterns to minimise cloud or snow cover. Multiple acquisitions are planned for some regions to account for seasonal variations in land cover. Acquired in a standardised 15 bands, the MERIS images are going to be processed with an upgraded algorithm that includes an ortho-rectification fool, correcting for altitude based on a digital elevation model (DEM) derived from the Radar Altimeter-2 (RA-2), another Envisat instrument.